We are confused as an industry. Celebrating a societal open court, we strive to ensure equality. Thought provoking titles are cultural blow backs against those unwilling to explicitly accept interactive media as art. But, what we played before has been smothered by timed irrelevancy. People remember DuckTales, not for its license and not for its Disney hallmark. Part of it is warming nostalgia, another is its spirited bounciness, a charming and inviting 8-bit spectacle of precision craftsmanship. Tetris is perfectly simple. So is DuckTales. Simpsons: The Arcade Game unearthed suspicious candor amongst critical circles, bemoaning length and crusty difficulty, sans reasoning for these inclusions when cabinets scraped across arcade floors. Simpsons, like DuckTales, has concerning obstacles to enjoyment, yet in written word, many seem confounded and deride decisions. We approach vintage video games professionally with the utmost callowness and gross misunderstanding . Childlike thinking is snickering at Ray Harryhausen’s imposing stop motion skeletons and condensing those sights to a laughable “claymation” moniker. In our corner, pixels are frightening boxes meant to be jeered from their low-fi existence. Most of early 3D development is a wash, bleeding noxious technological confusion in boxy, flickering polygons. Without conducive input devices, Goldeneye 64 is an out of shape, malignant mess. That aside, you have spotty success, Sony’s Jumping Flash a beacon of surreal ingenuity which hoists bothersome, first generation design quirks onto its shoulders to carry their burden. Despite grievances, no video game should die. Many have driven death-dealing, physical DRM from suicidal arcade boards in order to preserve their functionality. Goldeneye, once a proud staple of college dorms, should now be explored for cultural relevancy rather than discarded. Our culture will not be defined by current (and rightful) political leanings, but rather what we create and how we deal with perspective internally. We want to be stricken of childhood’s associative blight so badly, we’re willing to caress the new, and slander the old to reach those lofty aspirations. In reality, the medium is barely crawling from it terrible twos in terms of expressionism. Developer WayForward’s alterations to DuckTales, which include dialogue scenarios and level extensions, may compromise a fragile frame, relevant for criticism. Squandering opportunity to associate classic status due to DuckTales’ thin framework, brutish difficulty, and obnoxiously cloning foes, is preying on surface level dynamics. Bewilderment too is how sheepishly we accept remakes as necessary, where as do overs of King Kong are met with scathing diatribes within seconds of their announcement. Despising the vintage and welcoming a “fix” appears to be learned behavior exclusive to video games. We have changed. Our games are easier, lengthier, and more astute, yet pinning WayForward to a wall over decisions made 20 years ago, within what are now unfathomable hardware limitations, is ludicrous. DuckTales was specially crafted for a consumer market of broad differences from our own, and to spawn bile due to swinging expectations is to show voluminous disdain for a near incalculable swatch of our history, not only Capcom’s Disney success story. 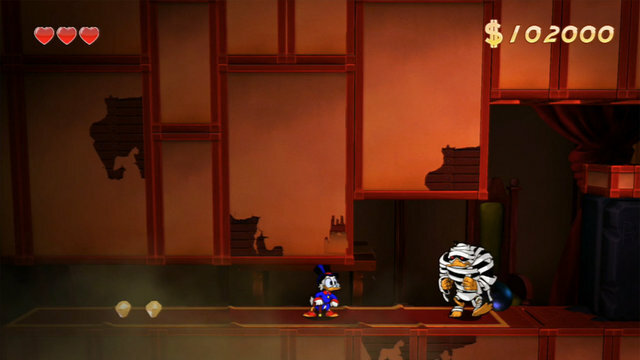 DuckTales Remastered was unveiled at PAX East 2013 to shared enthusiasm. Twitter trended this landmark remake to healthy levels of excitement – they were bringing back DuckTales, and it was awesome. With a pittance of words, the bluster has died; old games are old we have learned, and it’s their fault. Let them die. Oh, plus Wizard of Oz has pathetic special effects, and The Beatles’ relevancy dissipated because of Nirvana. Great read and a very well written article! I agree 100% with what you are saying. So true. People worship the “immortal” classics, but as soon as they are remade or remastered, they get harpooned.